The United States has a long tradition of offering refuge to those fleeing persecution and war. Oregon has always taken in refugees & immigrants from all over the world, and has been partaking in their aid and is determined to continue its efforts. The Portland Refugee Support Group (PRSG) is dedicated to helping refugee & immigrant families integrate into our society with ease and comfort, welcoming them with open arms and making them feel like family. Our mission at PRSG is to empower refugees through education, life skills training, and social support. 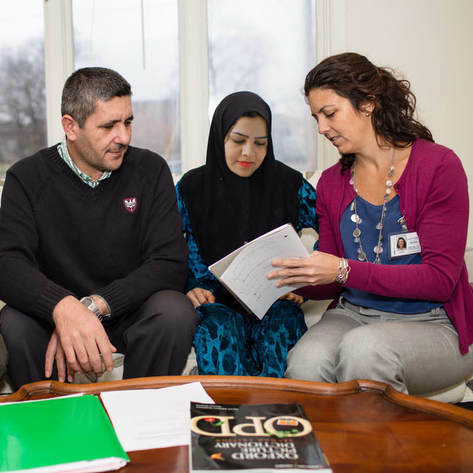 We focus on helping refugee families acclimate to life in America and become familiar with their community. A community where refugees feel they belong – a place where they are safe, prosperous, and able to pursue happiness. We are proud to have a GREAT group of volunteers to help the refugee & immigrant families with their day-to-day needs. However, there is always a need for more volunteers, as they aren't always available. We encourage you to reach out to us, join our team, and change a family's life. Donate: We’re always looking for toiletries and cleaning supplies for the monthly supply bags we distribute to refugee & immigrant families. Tutor: You can tutor the refugee or immigrant parents and children in English once a week to help them speed up their learning journey. Be a Friend: Invite them to community gatherings with other refugees from their home country, take them to the park, play a sport with them, etc. Please sign up as soon as possible so we can connect you to a needy refugee family. We thank you from the bottom of our hearts and hope to be working with you soon for the betterment of our world. There are more than 68 million people in the world today that have been forcibly displaced. About 25 million people worldwide have fled to other countries as refugees, and more than half of them are children. Most only make it as far as a neighboring country where they’re herded into camps and cities and forced to struggle to survive on their hosts’ limited, and often dwindling, resources. Less than 1% of the world's refugees are given the opportunity to restart their lives in a new country, and a small number of them get to live in wealthy countries like the US, Canada and the UK. About 3 million refugees have been resettled in the US since 1980. An average of about 80,000 refugees arrive in the US each year. But since 2016, the US has only resettled 33,000 refugees. Since 1980, more than 64,000 refugees have resettled in Oregon. An average of about 1,000 refugees have arrived in Oregon each year since 2002. The refugee admissions/vetting process is very strict and thorough, and can take up to 18 to 24 months. When the refugees finally reach the host country they need all the help they can get.